Handmade ceramic tiles with texture - handmade clay tiles. Handmade clay tiles are for the individualist! With these tiles I try to create variety and texture – no two are identical. Clay shrinks as it dries, and also again when it is fired in the kiln, so measurements are approximate. Their particular qualities come from working directly with the clay and slips with the hands using a variety of traditional techniques.Hand made clay tiles are made in batches which will vary from batch to batch – please order enough in one go! Hand made tile using random selection of neolithic imagery. Honey + green glazes. Different coloured clays have different characteristics and can be used with different glazes and coloured slips. Max size is about 6″ 150 mm, anything larger and cracking becomes an issue in the firing. They are ideal as a feature panel or a border even with small 1″ 2.5cm mosaic. They take time to make, dry and fire so are very much part of the ‘Slow movement’, but are worth it for the rich colour and texture they can add to a room. chic minimal design with dark blue glaze. These tile surfaces are cut with a wire to create a decorative surface. ten glazed with a deep crackle blue glaze. 3″ 7.5mm tiles approx. White clay tiles with a white glaze. approx 6″ 152mm tiles. Feature tiles- plain and scallop pressed clay tiles. Turquoise over white slip. 5′ approx 13cm. Tiles with stamped and stencilled decoration in 2 clays and a clear glaze approx 4″ 10cm tiles. Small ‘ mosaic’ tiles stamped with a variety of hand carved stamps and glazed to order. 1″ 2.5cm tiles. clay tiles with added stamped details . approx 4″10cm. Random decoration made using coloured slips and roulettes, unglazed to emphasise texture. Unglazed can be sealed but designed for decorative not practical use! 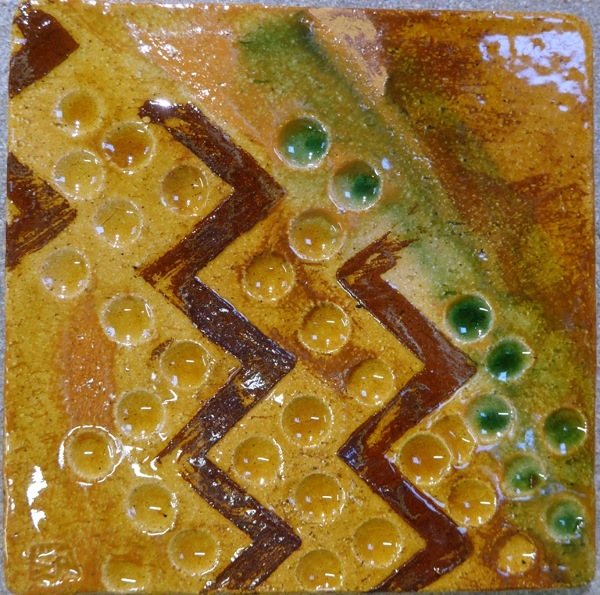 Tiles made by folding together 3 different coloured clays – agateware-and slicing like bread ten rubbing down to bring up the patterns! 5-6″ 12-15cm tiles. Agateware with plain 5 1/2″ tiles on the diagonal. Handmade clay tiles are often best used as a wall feature to provide colour and texture, they can be used singly in a block or as simple borders for kitchen tiles and for bathroom tiles. I also use them as part of tile mosaic panels as hob tiles or tile splash backs for basins and baths. These tiles can be practical, or purely decorative- even unglazed, eg. used as decorative framed panels to create a bold statement anywhere in the house or simply to create a quiet corner.